This year is heading to be the hottest or second hottest on record, according to the Met Office. It says global temeratures for the past 12 months are the warmest recorded by Nasa, and second in the UK data set, HadCRUT3. 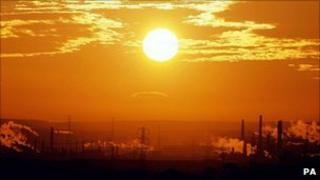 The Met Office says it is very confident that man-made global warming is forcing up temperatures. Until now, the hottest year on record has been 1998, when temperatures were pushed up by a strong El Nino. El Ninos are a warming event in the Pacific. This year saw a weaker El Nino, and that fizzled out to be replaced by a La Nina cooling event. So scientists might have expected this year's temperatures to be substantially lower than 1998 - but they are not. Within the bounds of statistical error, the two years are likely to be the same. "It's a sign that we've got man-made global warming," said Dr Vicky Pope, head of climate science advice at the Met Office. The last decade was the hottest on record, and Dr Pope warns it will turn out to have been even hotter by about 0.03C when corrections are made to data taken from buoys at sea. The buoys take temperature measurements a metre below the surface, where it is slightly cooler than on the surface itself. Measurements were previously taken mainly by ships. Climate sceptics say that until now, warming has plateaued over the last decade. The Met Office agrees that the rate of warming has slowed - but it maintains that is due to natural variability, not because man-made warming has stopped. They think factors in the slower warming may have been - a natural downturn in solar radiation; a small reduction in water vapour in the stratosphere; a possible increase in aerosol emissions from Asia; and the fact that strong warming in the Arctic is poorly represented in the way data is collected. Dr Pope says the slowdown in temperature rise is consistent with projections from climate models. She also says she expects warming to increase in the next few years. "The long-term warming trend is 0.16C," she says. "In the last 10 years the rate decreased to between 0.05 and 0.13. "There are a number of things that are affecting short-term temperatures. A lot of the heat could be distributed to the deep oceans and we don't know what's going on there." There is a question over how many times the Met Office has forecast a record previously. Dr Pope said they had not done so from her recollection. But a Met Office press release shows a forecast that 2007 would probably beat 1998. And a BBC report implies that they made the same prediction for the other El Nino year of 2003. Sceptics say this could prove the third time they have been wrong. But it is impossible to be wrong with a probabilistic forecast unless the forecast is 100%. It would certainly have eased pressure on the Met Office, though, if their 2010 forecast had been seen to be spectacularly accurate. Professor John Christy, a climate sceptic from the University of Alabama in Hunstville, said global temperature had plunged in the past two weeks, so 2010 was likely to remain in second place. He challenged the Met Office conviction that greenhouse gases were to blame for the warmth. "The cause of the warmth is speculation. There are numerous feedbacks at work (many of which are poorly modelled if at all), and it seems to me unimaginative to conclude that greenhouse gases are the dominant cause," he said. "There is no proof of such a cause in classical scientific sense - so we end up with a lot of opinions on the matter. Evidence is strong that centuries in the past 10,000 years were warmer than today without influences from human-related greenhouse gases."